The menopause changes all sorts of things, but did you know it can also make drinking (lots of) alcohol more risky, especially if you're on hormone replacement therapy? Here's what you need to know. By the time you've reached the perimenopause, you'll certainly have added plenty of alcohol-related tidbits your "knowledge bank". You'll know that alcohol can be an awful lot of different things — a social lubricant, a way to relax after a hard day's work, a terrible addiction that ruins lives and livers, something that may just promote heart health when used in moderation, and something that can, among other things, increase your risk of breast cancer. The idea that the (approaching) menopause in any way affects how booze affects your health may never have occurred to you, however. It does — and here's how. Booze: How much is too much? 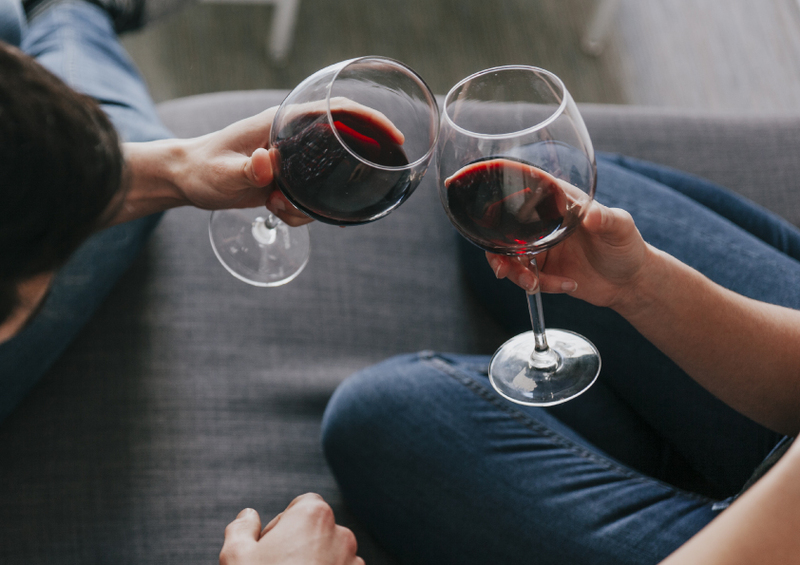 While you kick your feet up and enjoy that mid-week glass or two, you may rest easier having heard that moderate drinking is great for heart health. That may be true, and proven over the course of numerous studies, but research also shows that chugging down more than two drinks a day is more likely to give you cancer or a stroke than a healthy heart. "Moderate drinking" can be hard to define while you pour another drink into your son's favorite Spider-Man mug or those artisanal, hand-blown, weird-looking glasses someone gave you for Christmas, mind you — "one drink" might not mean what you think it does. The NIAA goes on to warn women against having more than three such "standard drinks" in a single day, and advises us to stay under eight drinks a week — based on biology, this isn't mere sexism. They consider a woman who sticks to this advice a moderate drinker, while they deem any female who exceeds these numbers to be a heavy or at-risk drinker. Binge drinking, meanwhile, is defined as loading up on so much booze within a span of two hours or so that your blood alcohol level is at or beyond 0.08 g/dL. It takes about four drinks to achieve this. These niceties apply mainly to those whose choice of drink is wine. We all know our risk of osteoporosis goes up after we enter the menopause, but research shows women who are moderate drinkers have stronger bones than those who don't drink at all. Since your risk of heart disease goes up once you hit the menopause, the heart-health benefits of booze matter more at this time — actual research suggests. This is true even for women on hormone replacement therapy. Most surprisingly of all, women in middle age and beyond who are moderate drinkers are less likely to be obese than those who steer clear of alcohol! It's easy to drink more than you think you do — for those of us who just crack open the beer and pop the bottle of wine, then enjoy the booze without measuring it out, anyway. The more you drink, the greater the risk that you'll experience some kind of alcohol-related disease. While moderate drinking appears to be good for heart health, heavy drinking actually increases your risk of heart disease, and the link is stronger in women than men. Research shows, however, that drinking alcohol at all increases your risk of developing breast cancer. How much? "Small but statistically significant" would be the term to use if you have one (standard, as defined above) drink a day, but women who down between two and five a day have a much higher risk — 1.5 times that of teetotalers. What's quite frightening for women going through the menopause is that being on hormone replacement therapy seems to strengthen this particular alcohol-related risk. Alcohol also adds to your risk of other cancers, a risk that again grows with the number of drinks you have. How does alcohol interact with your medications? From Tylenol to drugs you may be taking for hypertension, high cholesterol, allergies, heartburn, or arthritis, many over-the-counter and prescription drugs just don't mix well with alcohol. This was true before you hit the (peri)menopause all the same, but since you may be more likely to have to use medications on a daily basis as you get older, this is something to keep in mind. We all know that alcohol contributes to weight gain, but it specifically contributes to "central obesity" — fat around the waistline. Not only does the menopause already cause many women to gain weight they'd really rather not have, this kind of obesity is also specifically linked to heart disease. Some women report that booze induces hot flashes, something you'd probably not like. Your risk of osteoporosis and associated broken bones, already heightened by this time, goes up if you're a heavy drinker. Both going through menopause and drinking heavily seem to add to your risk of developing clinical depression — the combination only adds to this. Binge drinking — drinking a lot in a single "session" rather than necessarily being a habitual alcohol user — adds to your risk of type 2 diabetes. What should you know about alcohol consumption if you are on hormone replacement therapy? "Mixing" alcohol and hormone replacement therapy can lead to a higher risk of breast cancer, a longitudinal study with over 5000 participants found, while noting that this increased risk isn't present in women who drink but aren't using HRT. The amount you drink is, again, really important here — the study found that women who consumed up to two standard drinks a day had a threefold risk of breast cancer compared to those who neither drank nor used hormone replacement therapy, while that figure increased to five time the risk in women who had more than two drinks a day. This may at least in part be due to the fact that consuming alcohol boosts your estrogen levels, while HRT also contains estrogen; some breast cancers are estrogen-dependent. Some things never change — limited amounts of alcohol are generally OK, while lots of alcohol represents all sorts of bad news. Women who are going through or have hit the menopause who enjoy a glass of wine on a Friday night really don't have anything to worry about, while those that booze it up daily do, just as they did before this season of life came around. If you're on hormone replacement therapy (something you're advised to only use as long as you feel you really need it, anyway), however, you may consider hitting the pause button on alcohol until you're all done with that — but ask your healthcare provider about estrogen-only HRT, which is less risky, if you've already decided hormone replacement therapy is right for you, as this is less risky.